Why not have an SUV version of every single model you produce. 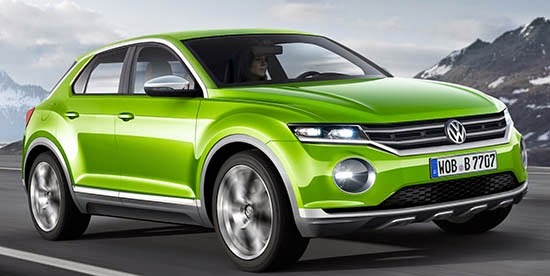 This is an illustration of what a production version of the T-Roc concept could look like. And it would be based on the next generation Polo. Since we are scheduled to get the next Polo in the US, I would assume this one will be coming over as well. This small SUV market will be exploding in the US very soon. Seems that the Juke has had the market for itself. But it will be soon joined by the Honda HR-V, Ford Ecosport and Chevrolet Trax. So, again, VW will be late to the party. Please show me proof that the Ford Ecosport is going to be sold in North America... ford has not announced that vehicle, just because there are photos of Ford testing that car on American Roads does NOT mean they are going to sell it here. It looks a bit like the Juke with the front lights and the rear wheel arch. VW needs to get some new,fresher products in the US.